9 grudnia w Berlinie odbyła się uroczysta gala wręczenia nagród European Film Awards. 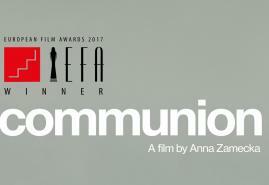 Laureatem w konkursie filmów dokumentalnych została "Komunia" Anny Zameckiej. Locarno Film Festival 2016 (Semaine De La Critique Best Film), Warsaw Film Festival (Best Documentary Award), DOK Leipzig Film Festival (Young Eyes Award), IDFA (Best of Fests), Minsk International Film Festival "Listapad", Bratislava International Film Festival (Best Documentary Film), Camerimage Film Festival, Trieste Film Festival (Best Documentary Film), ZagrebDOX, It's All True International Documentary Film Festival (Best Documentary Film), Hot Docs Documentary Film Festival, DOk.fest International Documentary Film Festival Munich (SOS-Kinderdorfer Weltweit Award), TRT Documentary Awards (Best Documentary Award), DOC Aviv Film Festival and OsloPIX (Grand Prix Documentary), Polish Film Academy Awards - Eagle (Best Documentary Film), Ânûû-rû Âboro Documentary FF, Nouvelle Caledonie, 2017 (Grand Prize), Astra Film Festival, Romania, 2017 (BEST DOCUMENTARY IN THE CENTRAL & EASTERN EUROPE COMPETITION). Lista zwycięzców znajduje się na stronie EFA.